South West facing, easily maintained linked Villa, three bedrooms, 2 bathrooms with open views and communal swimming pool in Gata Residencial. Off road parking with double carport at road level. There are a few steps down to the main entrance passing a rockery with plants. The front door opens onto a mezzanine floor with a guest bedroom/study & shower room (new shower screen). There is a bright and airy open plan living/dining room with a featured wood burning fireplace and views over the valley. A separate, modernised kitchen with fitted appliances, outside a utility area, and storage shed. From the dining area, there are double doors leading to a covered open Naya with exterior dining facility, which has an electrically operated awning to escape the midday sun. The easily maintained, fenced and secure terrace with potted plants gives ample space for relaxing on sun loungers. From the mezzanine level, a few steps lead up to a second double bedroom with fitted wardrobes. On this level, there is also the master bedroom with a walk-in dressing area and a full bathroom en suite. The master suite has double doors leading out to a terrace. The property benefits from full (Mains) Gas central heating, Security alarm and ceiling fans. All the taps/shower heads were replaced in 2018. There is recessed lighting in the ceilings and all wall & ceiling lights are new. The property has recently had all the interior and exterior walls painted, and the house is equipped with UK satellite TV & WIFI!! The Furniture is negotiable but separate to the sale of the property. Community charge is 250 and IBI (Town Hall Rates) 370 per year. Gata Residencial is a thriving multinational community of about 500 houses on the outskirts of Gata de Gorgos in the Marina Alta area of the Costa Blanca. 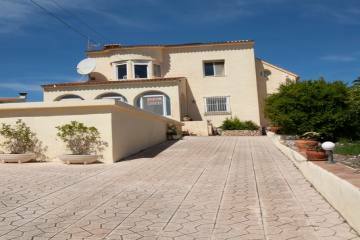 The urbanisation is located close to Pedreguer and the larger coastal towns of Javea and Denia. The nearest restaurant/bar is Monroes at the bottom of Monte Pedreguer and there is a wide choice of bars and Restaurants in the village. There is a MasyMas supermarket nearby on the N332 and the village has a wide range of small shops including several bakeries and fruit and vegetable shops. The town of Ondara is surrounded by orange groves and vineyards with mountains in the background making for a very scenic and country location. Access is good because Ondara is just off the A7 (motorway) and the N-322 road passes around the town. Portal de la Marina Ondara Shopping Centre/Mall. This indoor shopping center has many well-known retailers such as Zara, C&A, Clarks, Jack & Jones, Levi Strauss, Mango, Springfield, Stradivarius, and the Eroski hypermarket. There is also a cinema, bowling alley and food court. One of the main strengths of Gata Residencial is the active and friendly multi-national community of owners and residents.